Learn the fascinating art of using crystal frequencies to help you release negative baggage, heal from ailments, and balance your energy. 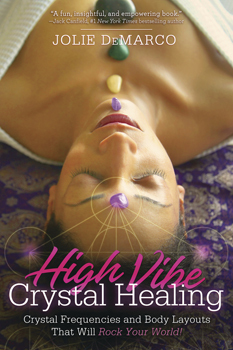 Featuring twenty-six crystal body layouts and sixty-six individual crystals and gemstones, High Vibe Crystal Healing is a groundbreaking book that helps you discover the properties of crystals for personal healing, fun, and wellness. Explore stone combinations that bring focus and purpose to your life. Discover how to use crystals to go out of body and visit past or parallel lives. Author Jolie DeMarco also includes tips and techniques for working with twenty-two essential oils to enhance your crystal sessions as well as a convenient guide to finding which crystals and stones best align with specific physical ailments and emotional blockages. Whether you're just getting started or are an advanced master healer, this book will help you harmonize and create more positive vibes with crystals and gemstones, magical vitamins for the body and soul.